The Graphic Multimeter MTX 3282B captivates by its folding graphic LC display. Besides the high accuracy, the graphic multimeter is suitable for many purposes. The multimeter shows up to 4 measurement values at the same time. The multimeter has a wide measurement range. 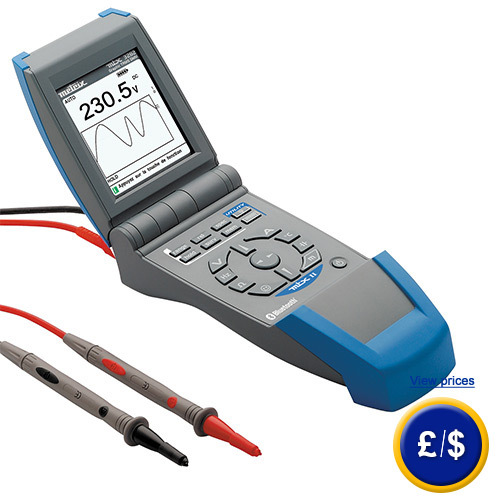 The graphic multimeter safely measures voltage up to 1000 V in AC and DC voltage ranges with. The graphic multimeter measures current up to 20 A. Besides the highly accurate measurement of current and voltage, the graphic multimeter also measures resistance, capacity, diode test, temperature, duty cycle, etc. If you have any questions about this Graphic Multimeter MTX 3282B, see the technical specification below or contact us: UK customers +44(0) 23 809 870 30 / US customers +1-410-387-7703. Our technicians and engineers will gladly advise you on all multimeters and all products in the field of measuring instruments, regulation and control and scales.